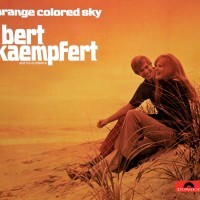 ORANGE COLORED SKY surely is one of Bert Kaempfert’s loveliest albums. Recorded in November 1970, the album was the first of his productions to use multi-track recording technique (eight sound tracks) and has everything that the name of Bert Kaempfert conjures up: his typical rhythm with its pithy bass, smooth-as-silk arrangements for strings and chorus, stereo-like entries of the winds from the right and left, and plenty of trumpet solos. The six new compositions by the Bert Kaempfert and Herbert Rehbein team range from pleasantly easy-going numbers such as Tea And Trumpets and Friends and the more gentle While The Children Sleep to the shuffle of Wake Up And Live. Also heard on this disc are new and old hits by other composers covering a time-span of 50 years. Bye Bye Blackbird and In Apple Blossom Time are typical “Tin Pan Alley” songs from the ‘20s: the latter was one of the most popular hits of its day and later a great success for the Andrew Sisters. The title-number Orange Colored Sky, composed by the accordion-playing band-leader Milton DeLugg, became famous in the 1950s in vocal versions by Nat “King” Cole and Betty Hutton; Cracklin’ Rosie was Neil Diamond’s very first Number 1 hit in the 1970s; and the rock group Blood, Sweat & Tears landed in the Top 20 with Hi-De-Ho. Snowbird, perhaps the most effervescent arrangement in this compilation, is a Country and Western number which brought the Canadian singer Anne Murray a gold disc in 1970; Bert Kaempfert’s recording was also immensely popular and became a real radio hit, being played over and over again both in Germany and abroad.